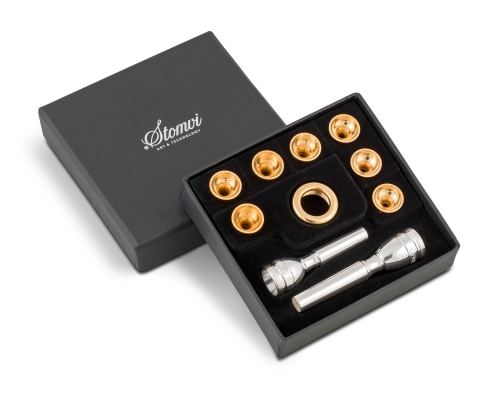 Stomvi offer this unique Mouthpiece system which makes it possible to use the same rim on Trumpet, Cornet or Flugel Horn (Flugel Shank extra). It enables the artist to keep the same feel on all instruments and gives you the security of having the ‘exact’ contact point on all instruments with inter-changeable cup depths to give total flexibility on all mentioned models. Basically 14 mouthpiece options in each kit, with a Flugel Horn backbore adding another seven choices.